Not too long ago, as far as tourism was concerned, Cambodia was perceived as little more than a setting for Angkor Wat. The great temple complex, spread across more than 150 square miles, casts a shadow over the whole country. As the one-time capital of the Khmer kingdom, it’s the symbolic center of an empire that once encompassed most of Burma, Laos, Thailand, and much of Vietnam. The 12th century temple is located in Siem Reap Province and abuts the town of Siem Reap, which it is nourishing into a gateway city. Siem Reap Province is located in northwestern Cambodia and is home to some 1,000 archaeological sites over an area covering 170 square miles. Almost 2.5 million people per year visit Angkor or about 7,000 per day and its most popular area, the area right around Siem Rep city, is always crowded. The recently completed three-day Songkran Festival (April 16 to 18) attracted about 200,000 visitors. The crowds of tourists have preservationists concerned about Angkor Wat, a UNESCO World Heritage site, which was already damaged by the Khmer Rouge and by a subsequent Vietnamese military incursion. At sunsets massive crowds tend to congregate at Angkor for the best view of sunset. These crowds were causing damage and so officials launched a website with 34 alternative sunset viewing areas. For visitors who want to experience the site in its true spirit, as a spiritual landscape disentangling itself from the jungle, there’s no need to chase crowds. The sheer size of Angkor allows visitors a choice as to what they will see, and consequently, what they won’t see. Google has created a great way to make those choices before you go. In April, Google completed its visual mapping of Angkor and it can now be seen on Google Street View in 360-degree panoramic imagery. You can also explore Angkor’s history online on Google’s World Wonders Project. The ways of experiencing Angkor range from hiking to helicopter tours. The most popular parts of the sites are literally crawling with tourists, so you should go with a plan that allows you to spread out from the overcrowded core. The overwhelming interest in the temples of Angkor Wat has Cambodia looking at ways to divert traffic by promoting a “second Angkor,” the Banteay Chhmar Temple. The Banteay Srey Temple, not far from Angkor, is offered by such companies as Destination Asia and Khiri Travel. Khiri offers an intimate camping experience among the ruins of the Banteay Chhmar Temples. The luxury tented accommodations are located adjacent to the temples. The initiative is being done with cooperation from the local community who are involved with tent setup, maintenance and providing hospitality. Kbal Spean lies about 20 miles from the main Angkor area in Phnom Kulen National Park. The site features a river bed carved with beautiful Hindu and Buddhist images. Called the “Valley of 1,000 Lingas,” the sand stone carvings bring figures in the Hindu pantheon to life. A linga is a carved representation of Shiva usually found in temples. Just last June, archeologists discovered the layout for an entire ancient city in this park. Tonle Sap, the largest freshwater lake in Southeast Asia, floods in early June, at the start of the rainy season, when the Mekong River overflows and diverts from its direct flow to the South China Sea and redirects into Tonle Sap. This forces the current to reverse direction, beginning a process that, by the end of October, will see the great lake increasing its size almost tenfold, making it the largest freshwater body in Southeast Asia. Tourists ride lake boats to visit various lake side villages that have built their economy around these strange variations by the lake. The Cambodian Cultural Village is divided into 11 villages or sectors, each a showcase of different landmarks and providing a peek into the lifestyles of the people from various provinces including the ethnic minorities. 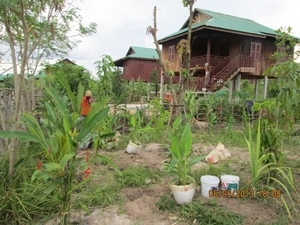 For a chance to temporarily live Cambodian village life you might consider a stay at the Run Ta Ek Eco Village on Chea Lea Thom Lake. Guests can witness a working facility that has small organic vegetable gardens and livestock pens. The village is located outside of Angkor Park about 20 miles from Siem Reap city. 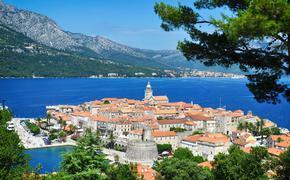 Of course, you can also stay with such five star properties as the ones offered by Anantara, Hyatt, Raffles and others. The Prek Toal Natural Reserve is a breeding ground for water fowl that’s not far from Siem Reap. It covers a 312 square kilometer area on Tonle Sap Lake and attracts a large variety of storks, ibis pelicans and eagles. The best time to visit is the dry season from December to May when flocks of migratory birds congregate. Officials in Cambodia are racing to keep up with demand for Angkor and need to put in the proper infrastructure to make the site available and protect it at the same time. In total, Cambodian tourism earned $2.5 billion during all of 2013, according to Cambodian Tourism Minister Thong Khon. In October last year, Angkor Wat ticket sale revenue had reached $41.4 million within the first nine months of 2013, a 14 percent increase on 2012 ticket sale figures. The current airport is overtaxed and too close to the temples for their good. 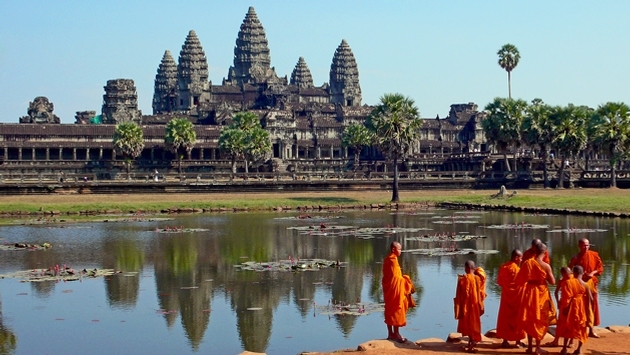 A South Korean company is building a $1 billion airport located 40 miles from Siem Reap in order to minimize noise pollution to the ancient Angkor Wat complex and would be able to handle long-haul Boeing 747 aircraft that could allow direct links to Europe and the Americas. The proposed Siem Reap International Airport has overcome recent legal and financial hurdles and is back on track. It will also include a "Special Economic Zone," a dry port and a 15.4 square mile city. At the end of the $500 million first phase, the airport will have the capacity to handle 4 million passengers a year, and will be able to handle 15 million after expansion. The airport is intentionally located far from Angkor in order to protect the temples from the noise of the aircraft.